I believe the most convincing evidence for evolution is the fossil record. The fact that animal fossils are layered from primitive to modern species from the bottom to the top of earth's rock layers is the most powerful proof that life evolved on earth. 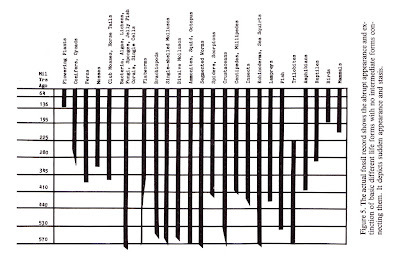 We can literally see the history of progression through the geologic column. Creationists try to avoid this issue by saying that the fossil record is incomplete (true, but the general evolutionary pattern is clear), the fossil record is mixed up in places (true, but the general evolutionary pattern is still obvious), and that the fossil record is not really one of progression. This last claim--that rock layers do not actually record a progression of bacteria to modern life--is false. Now the thing you must understand about this supposed graph of life is that creationists don't believe that one kind of animal evolves into another. They believe that groups of animals (like bears) can vary in form (like polar bears and black bears) but that these groups (or "kinds") are fixed and a bear could never evolve into some other kind animal. 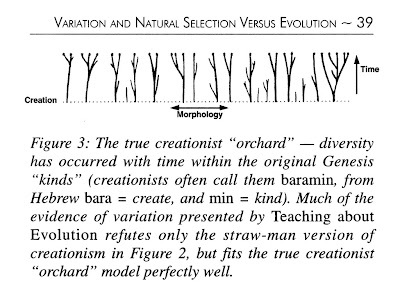 So while Sarfati did not label the "trees" in his diagram, as a creationist he believes that each tree represents a family, or some other fixed group of animal like bears, dolphins, hawks and so on. The problem with the creationist diagram then is that the trunks of all of these trees reach all the way to the ground. The diagram suggests that every major group of animals can be found down through every layer of the earth's fossil-bearing rocks--all the way back to the beginning. Note that I have rotated the diagram 90 degrees counter-clockwise so the vertical dimension represents the orientation of the rock layers (as if you are looking side-on with the edge of the earth). Sunderland's animal groups look like non-branching trees (he is trying to make the point that groups of animals don't evolve into other groups/kinds), but note that these tree trunks do not appear to all stretch back to the deepest layers of geologic column. The groups/kinds are not found all the way down through the geologic column. This creationist diagram confirms the point that I can rarely get creationists to admit: that fossils in the earth's crust are ordered in an evolutionary pattern from simple organisms at the bottom to more complex and modern ones at the top. Look at the diagram: Bacteria and Algae appear first on earth. Then worms. Later, fish, amphibians, reptiles, birds and mammals. If the diagram was more complete, we'd see that primitive birds (with teeth and short wings) appear before modern birds (eagles and robins). Jawless fish appear before jawed fish. And yes, monkeys and apes appear before humans in the fossil record. The Answers in Genesis diagram is deceptive. It suggests that all kinds of life from dogs to dodos to dinosaurs appeared all at once at the beginning of time. The truth is just the opposite. Plant and animal fossils are arranged in an evolutionary sequence, and any theory of life on earth must explain this historical record. But if humans evolved from apes, why are there still apes? I hear this question frequently from people (especially creationists). The answer is actually pretty simple. A better question would be, "if humans evolved from fish, why are there still fish?" Fish don't have lungs, can't walk on land, can't fly and are slimy. Surely us modern mammals like humans, bats, and tigers are so much more advanced! Why haven't fish gone extinct? The easy answer? 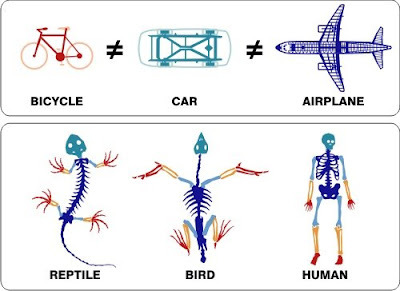 Fish are still around for the same reason bicycles are still popular years after the invention of cars and rocket ships: they are configured for different environments. Sure, fish can't do some of the great things that humans and birds do, but the job they do (swimming), they do very well. A bicycle is no moon rocket, but it's a much better vehicle for a quick run through the city park--or crowded streets. Heck, even after all these years of bicycles and cars, policemen still oftentimes ride horses! Creationists make hay over the occasional discovery of a "living fossil." Once in a while we find a living animal that we previously thought was extinct. Sometimes the living animal is very similar to million-year-old ancestors. But again, in the case of a fish (like the famous coelacanth), evolution long ago arrived at the best shape for living in the oceans. Why would we expect it to look different? Explaining the persistence of perfectly functional animals like fish or apes is not at all difficult. Evolution adapts animals to their environments. As long as those environments are still around (oceans, deserts, forests, etc. ), animals that are well-adapted to them have a shot at being around for a long time as well. Growing up in a conservative Christian home I was taught that the universe and everything in it was created in six days around six thousand years ago. I consumed numerous creationist books and videos as a kid and used what I learned in those materials to try to convert unbelieving friends. Only after college did I begin to doubt the creationist worldview. When finally confronted with the evidence I came to realize the truth of biological evolution. Today, it astounds me to look at the natural world and try to comprehend how it could make sense outside of an evolutionary framework. The fossils are stacked up in rock layers around the earth from primitive and extinct life forms to complex modern ones. Life on earth develops from the same genetic language in which the shared history of all living species are recorded. As a consequence of this universal ancestry, living things as diverse as bats and bears and blowfish share the majority of their organs, tissues, and bones. Evolution truly is the single most important principle in nature, explaining and predicting like no other model before or since. Understanding evolution makes the already-fascinating natural world all the more exciting. Without evolution you have millions of interesting species of plants and animals. With evolution you see the grand scheme—the patterns and relationships across the vast breadth of life on earth. It seems like all the time I experience "ah-hah!" moments as I learn about the natural world in the context of evolution. As a creationist there were so many contradictions and incongruities. I didn't realize how much I struggled to make reality fit my beliefs, rather than the other way around. There are lots of blogs, forums, and websites out there covering evolution vs. creationism. I'll touch on the debate on this blog as well, but my aim is to be more educational than argumentative. I've learned long ago that most zealots can't be moved by argument or reason anyway. My audience is not so much the creationist but the person who's never really studied natural history or evolution. Maybe you've questioned the plausibility of humans as apes, but you've still got an open mind. Maybe you simply haven't looked into the subject very deeply, or you've heard confusing arguments from both sides. Hopefully, this site will be an interesting and thought-provoking introduction to evolution. It might even change your mind.